Without asking today the questions about the days to come we‘ll be left without answers tomorrow. Why are we measuring our carbon dioxide emissions? Carbon dioxide is one of the greenhouse gases that with elevated concentration in the atmosphere cause global warming. This can be attributed to the fact that the layer of greenhouse gases reflects an increasing percentage of the thermic radiation emitted by the Earth. An excessive carbon dioxide concentration in the air can lead to permanent global warming and, therefore, considerably upset the ecosystem. Between the years 1970 and 2004, the global carbon dioxide emissions rose by 80%. To us, climate change is a fact, not fiction. As a consequence, we decided to initiate a companywide annual report on greenhouse gas emissions. 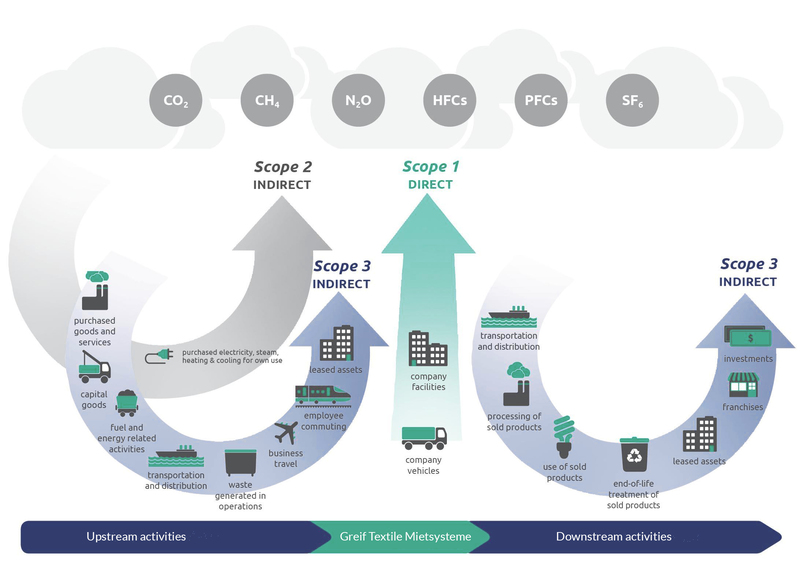 The report is aimed at providing an overview on both, range and structure of the greenhouse gas emissions caused by Greif Textile Mietsysteme, and serves as a basis for continued monitoring and gradual reduction of the emissions. For the years 2013 and 2014, the report covered direct emissions resulting from fuel consumption (Scope 1) as well as indirect emissions linked to energy supply (Scope 2). Since 2016, we decided to include the recommended expanded measuring parameters for the Carbon Footprint, i.e. take other indirect emissions like business travel, purchased textiles or employee commuting also into account (Scope 3). Since reporting year 2017 we first integrated our most important partner companies into our carbon footprint. For further information and details, find the Carbon Footprint Report 2018 below. The following chart indicates the relative emissions per turnover unit, per employee and per ton of processed textiles. All figures shown are including Scope 1, 2 and 3 emissions. It becomes apparent that the emissions in all three sections show a reduction. This resulted from reduced consumptions of fuels. Achieved on the one hand by significantly less use of heating oil and changed emission factors of natural gas. On the other hand we see positive effects by commissioning our new location in Berlin at the beginning of 2017. With cutting edge technology our subsidiary, is state of the art in energy consumption and energy efficiency.